You know what today is? That's right, it's July 1st! And do you know what that means? That's right, it's International Biscuit Day! Today marks the first official stage of the Tour de France and, being that Jen and I make up about 50% of the public in North America that actually watch the Tour de France, we are always very excited. There is nothing better than a sport that starts at 8:00 AM. Unless it's a really exciting stage. Then it starts at 6:30 AM. The tradition began years ago when a friend sent me about a thousand coupons for free Pillsbury biscuits in the mail. My house was always stocked to the gills with biscuit canisters and we made it a habit to bake some in the morning as we watched the tour. 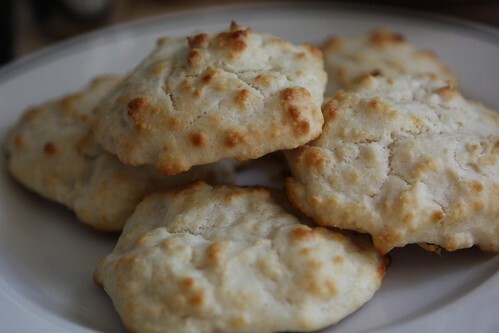 Since I'm out of coupons I now make the biscuits from scratch which is fine because they end up tasting way better. Also, it's nearly as easy to make biscuits from scratch as it is to unroll them from a cardboard sheath. The only ingredients are flour, baking powder, salt, butter, and milk. This year I added a little cream cheese into the dough as well before dropping them on a pan and baking them in an oven. The new air conditioner made running the oven in July a non factor. 15,000 BTUs, baby. This is basically the only day of the year I have a non-vegan breakfast or anything remotely heavy. 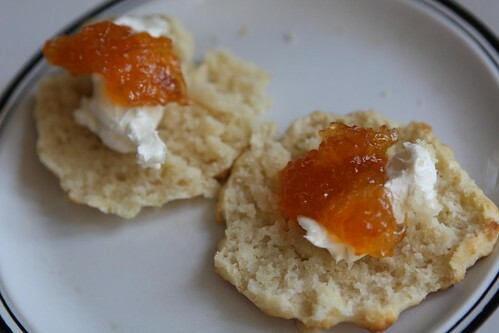 I served the biscuits up hot with cream cheese and grapefruit marmalade leftover from the case that Jen got for Christmas eighteen months ago. Oh, and happy Canada Day too. We celebrated by eating biscuits in America and watching men in Belgium ride bicycles. One of them, Ryder Hesjedal, was even Canadian! I keep reminding Jen that I built my team for the tough mountain stages. We'll let her have today since it's Canada Day. It's a three week race so she'd best not get cocky. Happy International Biscuit Day, Everyone!